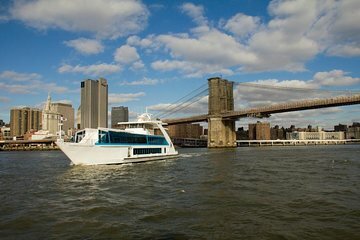 Ring in the holiday season on a memorable lunch cruise around New York City. Aboard a comfortable Hornblower yacht, cruise along the Hudson and East Rivers and through New York Harbor, past some of the city's most iconic landmarks including the Statue of Liberty, Ellis Island, and the Manhattan Bridge. Indulge in a seasonally inspired lunch buffet, and make merry with family and friends as an onboard DJ spins festive music.